Warm up your space with this bronze track head from Juno Lighting. This contemporary, line-voltage painted bronze track head has a flared housing made of drawn steel with a machined steel stem. 90-degree aiming capability and 358-degree rotation lets you shine the light just where you need it. Featuring a ceramic base twist and lock GU10 socket with nickel-plated copper alloy contacts that provide precise spring action, and a true, positive electrical ground. A spring-loaded locking latch with embossed polarity arrows secures head to the track. This Juno Lighting track head is compatible with Trac-Lites and Trac-Master Trac systems; for Trac-Master 2-circuit track, "pull-up" contact to "up" position. 3 3/4" high x 2 3/4" wide x 4 3/4" deep. Takes one 35 watt to 50 watt GU10 bulb (not included). Painted bronze finish; drawn steel housing with machined steel stem. Compatible with Juno Trac-Lites and Trac-Master systems. 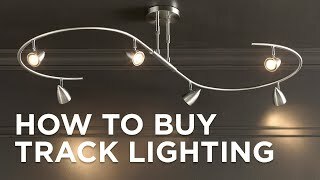 can you use led lights with this system? BEST ANSWER: Hi, yes LEDs can be used with this track head. Do the tracks have end caps? BEST ANSWER: The individual tracks will come with one end cap. Typically the power feed will be on the other end, though if using a floating power feed, that part will come with an additional end cap to close the other end. Finished in blackthis contemporary track bullet head features a mini swivel design with an adjustable socket for directional illumination. This contemporary track bullet head from Juno Lighting features a mini swivel economical lamp holder with an adjustable socket for adjusting the light.